This program uses the Golden and Wilson treatment for an asymmetric top without nuclear quadrupole coupling, J.Chem.Phys. 16, 669 (1948), and as summarized in Gordy&Cook, 3rd ed., pp.468-477. Stark coefficients for first, second and mixed order components are calculated if you know how to read the output! The best I can do to help you is by providing below a scanned version of a hand annotated copy of the output (from about 1978) that survived in my archives. NOTE: this program is kept here for various historical reasons, whereas it is recommended that the program QSTARK is used for current research applications. STARK.RES Results file for the data above, which can be compared with the Golden&Wilson table of A,B coefficients. Note that there is a known bug in the coefficients for the 000 and 101 states. STARK.JPG Scanned version of a hand annotated copy of the output to serve as rudimentary documentation. 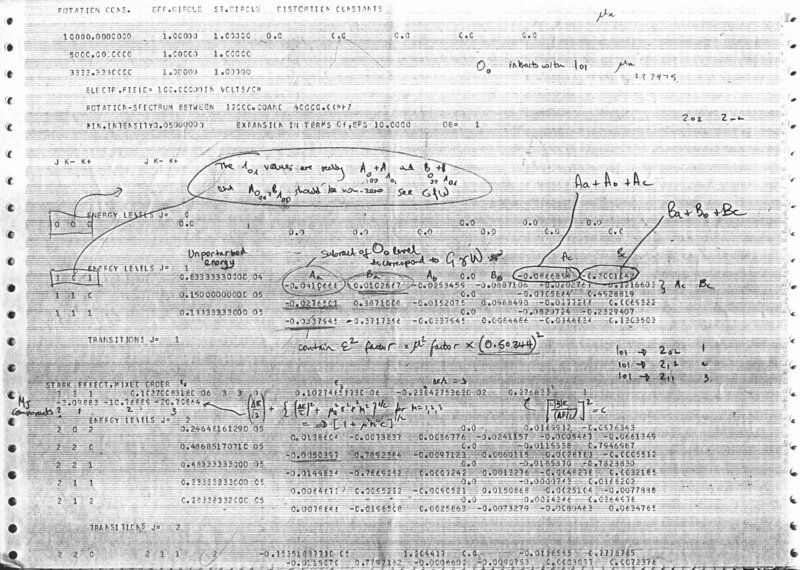 This is a modified version of the program STARK.F written by H.M.Pickett. Like its predecessor, SZK is a postprocessing program working on output from the SPFIT/SPCAT package. The program calculates the same quantities as STARK, but it takes its data from an .STR file produced by a prior run of SPCAT. The .STR file contains in the second column the reduced transition dipole matrix element which is equal to the square root of the linestrength. This is the basis for evaluating the Golden&Wilson type Stark coefficients as defined in J.Chem.Phys. 16, 669 (1948). The .STR file is produced by setting STRFLAG in the .INT file to 1 (i.e. the tens digit in the first number in the top line has to be 1). The output from SZK is written to an .STK file. Modifications to Pickett's original are as stated at the top of the listing and have gone mainly into producing what is hopefully self-explanatory output. Only the coefficients for the energy levels are calculated so that those for the observed transitions have to be set up by hand. Note that with this version the coefficients should be calculated by setting only one of the three possible dipole moment components to unity - if several components contribute to the Stark shift then results from two or three such separate runs of SPCAT and SZK should be combined. SO2.STK Specimen results for SO2 to compare with the Gordy&Cook test case, p.474 (3rd Ed.). This file is generated by first running SPCAT, which requires files SO2.VAR and SO2.INT, then running SZK on the results. H.P.Benz, A.Bauder, Hs.H.Gunthard, J.Mol.Spectrosc. 21, 156 (1966). It is possible to calculate and plot the behaviour of selected Stark components with the electric field. The program can produce simple diagnostic ASCII plots in the standard output file, as well as appropriate files for the gle program, and thus to obtain PostScript output. Z.Kisiel, J.Kosarzewski, B.A.Pietrewicz, L.Pszczolkowski, Chem. Phys. Lett. 325, 523-530 (2000). Extensive dump output, as controlled by the IDUMP parameter, allows checking of the internal workings in order to obtain a more detailed insight into such behaviour. Some compilers (e.g. f77) may treat the backslash '\' character in strings as a command to generate special characters. This will affect the proper generation of xtitle and ytitle lines in the .GLE file. If this is the case replace '\' by '\\'. QS.EXE Executable for those who have problems compiling for Windows - should work for W98/Pentium I upwards. Compiled with IVF9.1. The program now uses dynamic dimensioning so it is only limited by the memory available for its execution. OCS.Q Data set for the standard calibration molecule, set up to determine the electrode spacing. Note the use of asymmetric rotor quantum numbers, annotations between lines of the dataset, automatic line counting, and simultaneous fit of ΔM=0 and ΔM=±1 transitions. OCS.RES Abbreviated results file for the above. For supersonic expansion, cavity-FTMW spectroscopy there are practical limits on the magnitude of the applied electric field so that Stark shifts are typically less than 1 MHz. This results in only moderate precision of calibration. MECN.Q MEI.Q Data sets for the two calibration molecules used in Warsaw. Larger dipole moments allow measurement of considerably larger Stark shifts for available electric fields than is the case for OCS. MECN.RES MEI.RES Results files for the above. Note the improved precision in the determination of the cell constant and good correspondence between the two determinations. ISOX.RES Results for the above - only an approximate version of intermediate field analysis was used in the original paper, and appreciable improvement is apparent. Note that there are some problems in eigenvalue assignment near line 44 - the scheme in the program is over simplistic and fails, it will hopefully be improved when a really trying case appears. MEIK0.RES Results for the above. W.Q Data set for (H2O)2H35Cl similar to W2HCL.Q above adapted to produce the basis for Fig.4 in Chem.Phys.Lett. 325, 523 (2000). Each of the six bottom lines specifies a Stark lobe for which calculated points should be generated, and defines the voltage range, the number of points to be calculated and the point distribution (whether linear or quadratic). The last line also defines the Stark shift range of the plots. EXP.DAT The optional data file containing measured data points to be superimposed on the Stark component plot. W.RES The main output file produced by QSTARK from the above data, containing blocks of calculated points for the Stark components, as well as a simple ASCII pseudoplot at the bottom. The same run of QSTARK also produces files EXPTPLOT.DAT, W.GLE and six files W1.DAT,...,W6.DAT. W1.PS The PostScript plot obtained by changing "The number of iterations" parameter in W.Q above from -2 to -11. In this case the plot is in portrait orientation and is of frequency against voltage.